KISS are taking an active part in NF Awareness Month. Neurofibromatosis is a genetic disorder that affects one in every 2,500 births. NF is more common than Cystic Fibrosis, Muscular Dystrophy and Huntington's Disease combined. 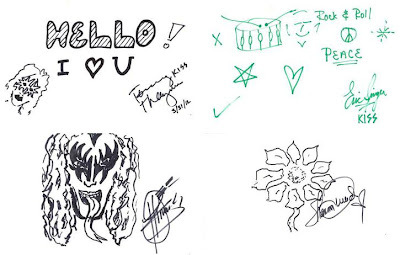 As part of NF Awareness month, celebrity doodles, including the ones pictured below by KISS members Gene Simmons, Tommy Thayer and Eric Singer, along with Mrs. Simmons (aka Shannon Tweed) are available for auction on eBay until May 20th. These doodles have a very important aim: the funds they raise will benefit NF, Inc. Network, an organization dedicated to providing support to individuals and families affected by neurofibromatosis (NF). Funds raised from the Doodle Day auction will go to support education, advocacy, coalitions, and research for treatments and a cure. To learn more about NF, visit www.nfnetwork.org. Bid on the doodles now at eBay here.